Within Montana, this species if found only in a small geographic area and the total population exists within a few colonies. The population appears to have declined over the last few decades, and faces ongoing threats from sylvatic plague. CommentIn 2016, 5 colonies were occupied and only 4 of 23 historic colonies were active. This may indicate a substantial decline in recent years. ScoreA - Substantial, imminent threat. Threat is moderate to severe and imminent for most (>60%) of the population or area. CommentPlague has had substantial negative impacts on this species, and mortality events are still common. Persecution of populations due to perceived competition with livestock and the disruption to agriculture caused by burrows and clipping remains an ongoing threat. ImmediacyHigh - Threat is operational (happening now) or imminent (within a year). White-tailed prairie dogs are medium-sized squirrel-like rodents. Adults weigh around 500-1000 grams; males are about 36 centimeters long and females 31 centimeters long (Foresman 2012). Legs are short and feet have well developed claws for digging. The tail is short and flattened with a whitish tip. The back is a yellowish-buff mixed with black that becomes lighter on the belly. Distinctive brownish-black patches are present above the eyes and on the cheeks. Distinguished from the only other prairie dog found in Montana, the black-tailed prairie dog (Cynomys ludovicianus), by its smaller size and white-tipped tail (Foresman 2012). White-tailed prairie dogs are non-migratory. Juveniles disperse to other colonies or the periphery of their natal colony in September/October. Throughout their range, white-tailed prairie dogs inhabit xeric sites with mixed stands of shrubs and grasses. 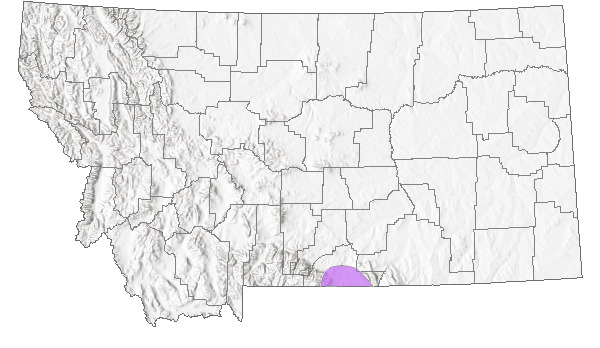 In Montana they inhabit these habitats dominated by two types of vegetation: areas with Gardener's saltbush (Atriplex gardneri) with lesser amounts of big sage, and areas with small-flowered marsh-elder (Iva axillaris) and winterfat (Krascheninnikovia lanata)(Flath and Paulick 1979). They live at higher elevations and in meadows with more diverse grass and herb cover than do black-tailed prairie dogs (Wilson and Ruff 1999) although their range in Montana is at relatively lower elevations than other areas across their distribution (Foresman 2012). White-tailed prairie dogs feed primarily on forbs. Early spring diets in Colorado showed white-tailed prairie dogs fed heavily on sagebrush and saltbush, with a shift towards dandelions and goosefoot as these forbs became available (Foresman 2012). Food habits in Montana are probably similar. Colonies in Montana average 54 acres. They do not clip vegetation like black-tailed prairie dogs. Maternity burrows are extensively excavated and can be identified by the presence of current accessory digging (Flath 1978, 1979). No specific reproductive information is available for Montana, however in other parts of their range breeding occurs shortly after female emergence from hibernation in late March and early April (Clark et al. 1971). Gestation requires about 30 days and young are born in late April and early May. Litter sizes range from 2 to 8 and average around 5 young (Flath 1979). One litter is produced annually. Juveniles appear above ground in early June, 5 to 7 weeks after birth. Both sexes breed as 1-year-olds. White-tailed Prairie Dogs are classified as a Species of Concern in Montana due to a limited distribution within the state and a variety of threats to the population. Prairie dogs are managed under the Conservation Plan for Black-tailed and White-tailed Prairie Dogs in Montana (Montana Prairie Dog Working Group 2002). Please consult this plan for details concerning prairie dog management in Montana. On December 4, 2017, after a thorough review of the best-available scientific and commercial information, the U.S. Fish and Wildlife Service released a 12-month finding that the species is not warranted for listing under the Endangered Species Act at this time because it is not currently in danger of extinction and is not likely to become in danger of extinction within the foreseeable future (USFWS 2017). Clark, T. W., R. S. Hoffmann, and C. F. Nadler. 1971. Cynomys leucurus. Mammalian Species 7:1-4. Flath, D. A. and R. K. Paulick. 1979. Mound characteristics of white-tailed prairie dog maternity burrows. American Midland Naturalist 102(2):395-398. Flath, D. L. 1978. At home with the prairie dog. Montana Outdoors. 9(2):3-8. Flath, D. L. 1979. 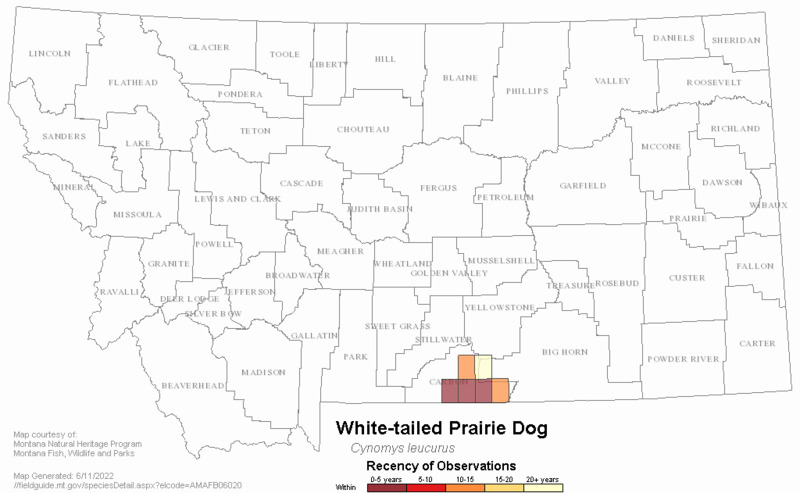 Status of the white-tailed prairie dog in Montana. Proceedings of the Montana Academy of Sciences 38:63-67. U.S. Fish and Wildlife Service. 2017. Endangered and threatened wildlife and plants; 12-month findings on petitions to list four species as Endangered or Threatened Species. Federal Register 82(233): 57562-57565. Wilson, D. E. and S. Ruff. 1999. The Smithsonian book of North American mammals. Smithsonian Institution Press, Washington, D.C. 750 pp. Atkinson, E.C. and M.L. Atkinson. 2005. Priority sending and receiving sites for White-tailed Prairie Dog relocation in Carbon County, Montana. Unpublished report to the Bureau of Land Management. Marmot's Edge Conservation. Belfry, Montana. 11pp. Bureau of Land Management. 1979?. Habitat management plan prairie dog ecosystems. USDI, BLM, Montana State Office. Wildlife Habitat Area MT-02-06-07-S1. 61 pp. Burns, J.A., D. L. Flath and T. W. Clark. 1989. On the structure and function of white-tailed prairie dog burrows. Great Basin Naturalist 49:517-524. Faunawest Wildlife Consultants. 1998. 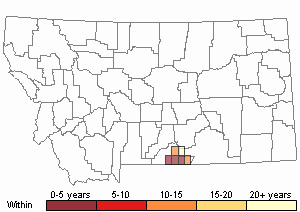 Status of the black-tailed and white-tailed prairie dog in Montana. Prepared for Montana Department of Fish, WIldlife & Parks. Goodwin, H.T. 1995. 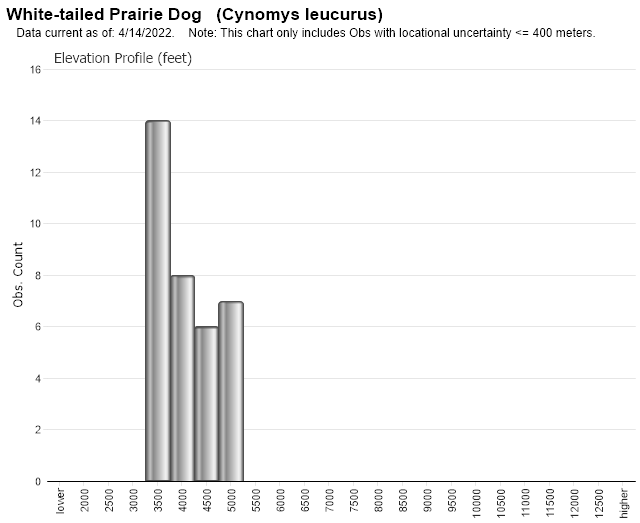 Pliocene-Pleistocene biogeographic history of prairie dogs, genus Cynomys (Sciuridae). Journal of Mammalogy 76:100-122. King. J. A. 1955. Social behaivor, social organization, and population dynamics in a black-tailed prairie dog town in the Black Hills of South Dakota. University of Michigan, Contributions from the Laboratory of Vertebrate Biology 67:1-123. Linder, Rayond L., and Conrad N. Hillman, 1973, Proceedings of the Black-footed Ferret and Prairie Dog Workshop, September 4-6, 1973. Rapid City, South Dakota. Oldemeyer, J.L., D.E. Biggins, B.J. Miller, and R. Crete, editors. 1993. Proc. of the symposium on the management of prairie dog complexes for the reintroduction of the black-footed ferret. U.S. Fish Wildl. Serv. Biol. Rep., No. 13. 96 pp. Smith, R. E. 1958. Natural history of the prairie dog in Kansas. Kansas University. Museum of Natural History: Miscellaneous Publications Number 16. 36 pp. Tileston, J.V., and R.R. Lechleitner. 1966. Some comparisons of the black-tailed and white-tailed prairie dogs in north-central Colorado. Am. Midl. Nat. 75: 292-316. 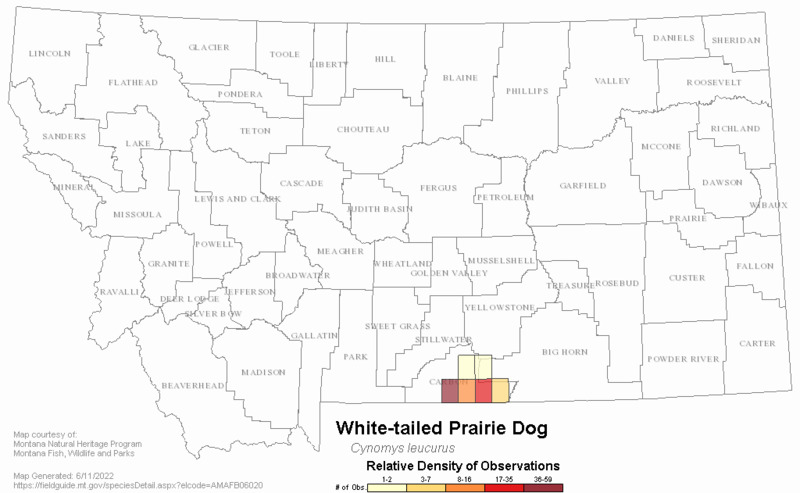 Web Search Engines for Articles on "White-tailed Prairie Dog"